Special thanks to Rita Sheridan for permission to reproduce this picture of the Lincolns visiting the sphinx. It was taken from her website about her grandfather, Colour Sergeant Winkfield. 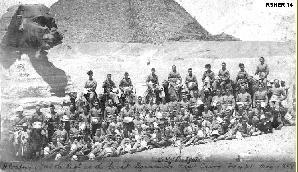 Malta was only the first stage of the 1st battalion's overseas tour and their next posting was Egypt, where they arrived in February 1897. They were posted in Cairo and after almost a year there they had just about got ready for embarkation to India when they were ordered to join the force which Kitchener was gathering for the re-conquest of the Sudan. attached to the Lincolns wrote: "Looking through telescopes, the coloured fringe in the distance turned out to be masses of Dervishes carrying banners, filling the whole of the horizon". The Dervishes could be heard advancing, singing as they came. It was a desperate struggle. The Lincolns had a close and deadly conflict with the Dervishes and then had to go to the aid of another brigade whose men were down to their last three rounds. Arriving at the double, the Lincolns joined in a terrific charge to drive back the enemy. The savage battle lasted for five hours, and an eye-witness said: "Never did a foe oppose British arms more strenuously and with more heroic courage". In the end about 10,000 Dervishes lost their lives. In November 1898 the 1st Lincolns left for India and stayed there until returning to England in 1912.
cathedral, the troops camped on South Park for the weekend. They were entertained on the Saturday evening at the recently-opened Drill Hall in Broadgate, Lincoln. Their special trains arrived at Lincoln on the Monday to take them to Sheffield. Everywhere the troops had been welcomed and entertained by enthusiastic crowds. Above: Dervishes on the horizon! Just before Christmas 1899, the 2nd Lincolns were back at Aldershot when orders were received to embark for South Africa. They took a prominent part in a major action at Paardeberg when General Cronje and 4000 of his men surrendered, and were in action at Modder River and the capture of Bloemfontein. In June 1900 they were part of Lord Roberts' advanced guard in his march to Pretoria. 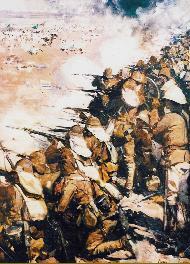 They came under heavy fire in a range of kopjes to the south-west of Pretoria but held their position. Pretoria was entered on 5th June. On 10th July, a detachment of the Lincolnshire Regiment and the Scots Greys set off for Nitral's "Nek" (a "pass"), 18 miles from Pretoria. They were ambushed by a large force of Boers and there was a desperate fight. Despite urgent calls for assistance there was an unaccountable delay in sending reinforcements from Pretoria. It was hopeless. Heavily out-numbered, and with almost 25 per cent casualties, they were forced to surrender. The men were released a couple of months later. Volunteers from the 3rd battalion (the former North Lincolnshire Militia) also went to South Africa, but the Boer War ended not long after they arrived and they never went into action. 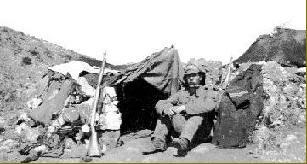 The 2nd battalion remained in South Africa, at Barberton, East Transvaal, until they returned home in March 1904. Below: Bivouac on the veldt. 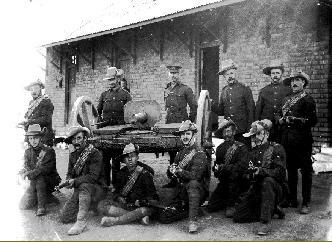 Above left: A tough-looking group of 3rd battalion volunteers man a Maxim gun in South Africa. 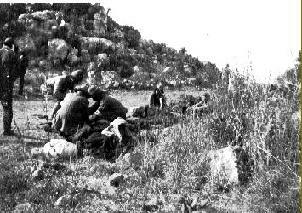 Above right: Doctors teat the wounded after action near Pretoria.